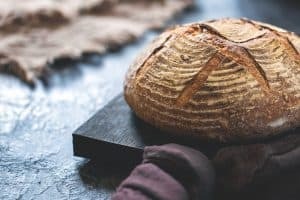 Until two centuries ago when yeast became commercially available all bread was made on the basis of sourdough starter. Making your own starter is a way to cultivate the wild yeast naturally present in the flour. Sourdough is based on the principle – use a bit of previous batch to start the new one. Making sourdough starter at home is very simple as all you need is water and flour. Beyond that, you will need patience and persistence as the process takes several days. After first or second day bubbles will start forming meaning that wild yeast is becoming active and starting to multiply. Over the few days you will continue to feed your initial starter with flour and water which will speed the fermentation process. After 5 days an active frothy starter will form meaning your starter is ready to be used. 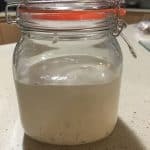 Have you tried making sourdough starter? 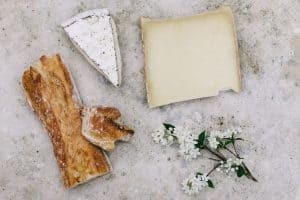 Step by step guide on making sourdough starter at home. Day One: Sterilise the glass container with boiling water or wash well with warm soapy water. Combine whole wheat, rye or all-purpose flour with the cool water in the glass container. Stir everything thoroughly until combined into smooth batter with no dry flour anywhere. 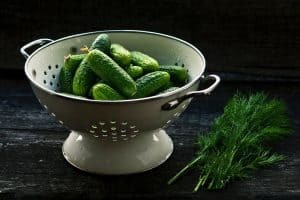 Close the container and leave it to ferment at room temperature for 24 hours. Day Two: You may or may not see a bit of growth and bubbling. If there is no bubbling at all that is fine too. Sometimes it takes for the starter longer to begin to ferment. Discard half of the starter and feed the remaining starter by adding water and flour. 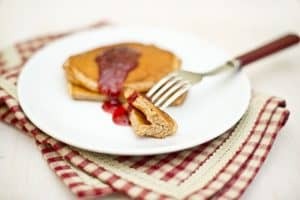 Mix it well to remove any dry flour until combined into smooth batter. Close the container and let the mixture rest at the room temperature for 24 hours. Day Three: By now surface of your starter should look dotted with bubbles and starter should look larger than on the previous day. Discard the half of the starter and add new flour and water. Stir well until smooth batter texture is achieved. Close the container and let it sit at the room temperature for 24 hours. Day Four: Your starter should be visibly larger than previous day and more bubbles should be formed. You will also notice that starter smells a little sour and yeast-like. Repeat the Day Three feeding process and let it sit for 24 hours at the room temperature. Day Five: Your starter should be almost ready. Repeat Day Four process. Day Six: Your starter should be ripe and ready for use in baking. Keep in mind that depending on the environment starter may take up to 10 days to growth. 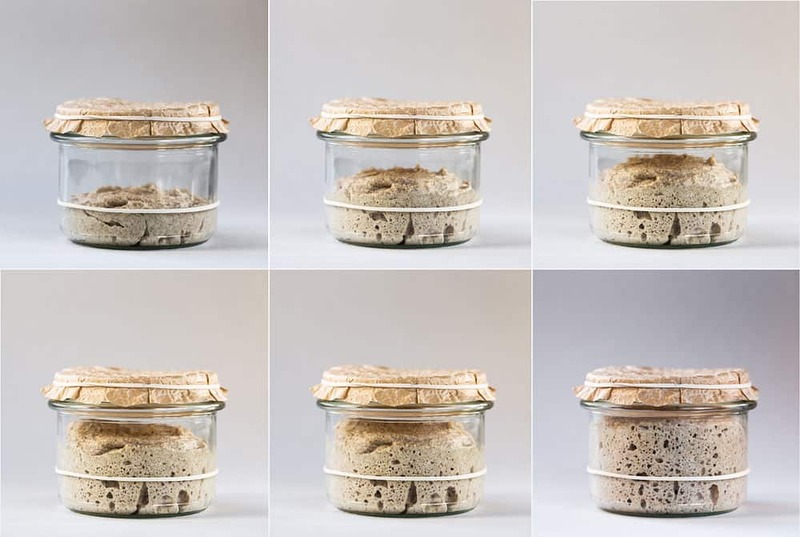 If you feel like your starter has not grown much in the last five days, there are no many bubbles and does not have sour and yeast smell then continue to feed it for another few days. Used starter can be stored at the room temperature for several days but it requires feeding every second day. 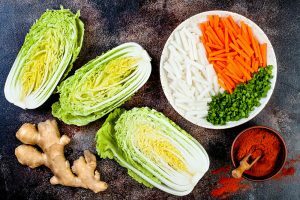 You can also store the starter in refrigerator but must be removed and fed once a week at room temperature for at least 12 hours before returning to the refrigerator. Equipment: scale or measuring cup, glass container with a lid and a mixing spoon. I just made my first starter. We’ll see how it turns out. Thank you!!! That’s awesome. Would love to hear your experience. Feel free to share photos too. I live in a warm and humid place, my starter is booming! After only 2 days and 1 feeding it’s bubbling and tripled in height. How many days should I give it before using? Great to see your starter is growing. As you already see bubbles I would recommend feeding it twice more then you can start using it. Good luck!